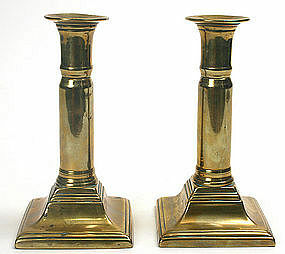 Pair of English brass Georgian telescopic ejector candlesticks, c.1800. Size: 6.75" - 9.25" height x 3.5" x 3.5". Condition: Some tiny stress cracks to the top of the lower section of one candlestick (see photos detail). Also, one stick requires extra effort to get it to remain in the fully extended position and probably required some sort of new dampening material to keep it in place.